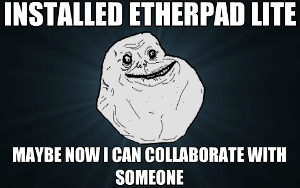 Today we’re proud to announce Etherpad 1.4. Let’s be honest here, there are no killer features in this release however this release does contain LOTS of bug-fixes and security patches. All of the killer features exist as Plugins, once you upgrade Etherpad we suggest you check out the available plugins because some really great ones exist. The introduction of a more modular toolbar means you might want to upgrade your settings.json, adding the new toolbar objects. To do this simply copy the toolbar objects from the settings.json.template, this is optional though and not required. We have been crazy busy. We have hundreds of organizations that now run Etherpad and our team has mostly been focusing on integrating with their platforms and resolving their issues. Thankfully those companies have allowed us to commit back to the open source project both to core and as plugins, also John got busy with a new startup. Thanks to GlobalSign for the free cert. Thanks to Nginx for making it easy to implement. Thanks to Jesus for staying holy. Enjoy and remember beta.etherpad.org is a play-ground, don’t use it for any real science. 1.4 is due soon, feel free to help us push it out, it’s crowning.